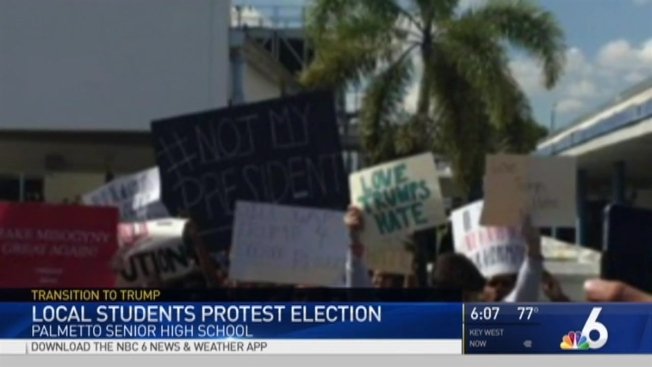 As protests continue across the country following the election of Donald Trump, students at one Miami-Dade high school staged their own protest Thursday – and it had some parents upset. Around 25 students at Palmetto Senior High School walked out of class at 12 p.m. for a protest outside that lasted about 15 minutes. Some carried signs while others shouted slogans throughout the event. Parents were sent an email from the school’s assistant principal, Dr. Bridgette Tate-Wyche, informing them of the protest. The email said, in part, that "We promote the core values of citizenship, kindness, fairness and respect." Some parents, however, are upset that the protest was allowed to take place at a high school. 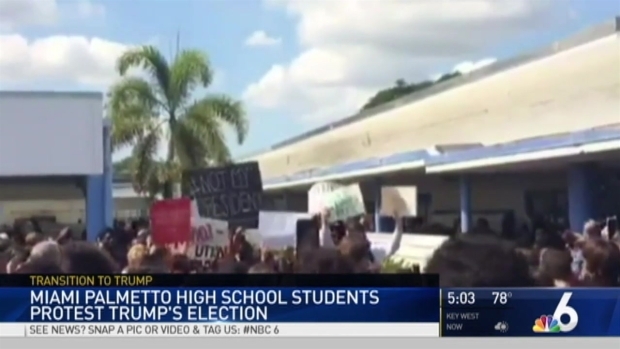 Mercy Mesa, who has two kids at Palmetto High, told NBC 6 she was upset to hear that the protest was approved by the school. Around 25 students at Palmetto Senior High School walked out of class at 12 p.m. for a protest against president-elect Donald Trump. "What’s not okay is getting a call of a 'peaceful demonstration' that was anything but,” Mesa said. 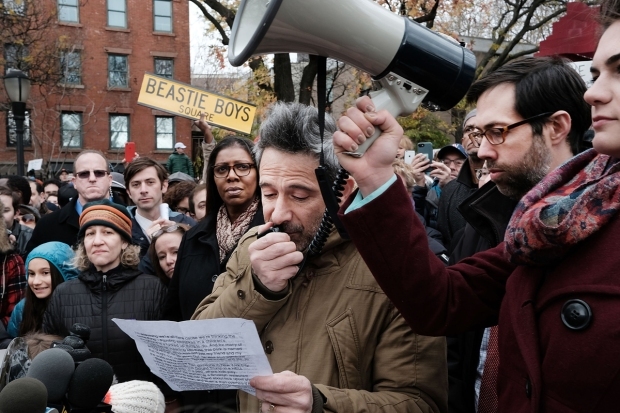 "We got an email at 11:59 a.m. and the protest took place one minute later." Mesa said she viewed parts of the protests on social media, claiming students were using derogatory terms to describe the President-elect. "Our country is so divided, what we need to do now is unite and not cause anxiety to children who can’t vote," Mesa said. Other parents said they weren't upset and were happy their kids were allowed to voice their opinions. "My son voted for the first time and he lost. His candidate was defeated by a person he considers a vile person. He's angry like most of us," parent Natasha Budhu-Mignott said. "His father and I are thankful the school respected these young adults' voices and allowed them a way to peacefully express their disappointment because we are too very disappointment and I don't even know how to consoles ourselves, much less our son. Besides, protesting is our constitutional right as it is theirs as well. So those angry parents are obviously Trump supporters who are happy and are celebrating whereas the rest us are in deep agony over the outcome." Several school officials were outside with the students during the protest. Miami-Dade County Public Schools policy does allow for peaceful and safe protests on school property.